So I have been in Seattle for a couple of weeks on a work gig but just managed to hit the dirt. Man can not live in the dirt alone so I have been enjoying some of the other wonders of the Pacfic Northwest, thier great microbrews. In addition to the 10+ brewpubs in the Seattle area I have swelled hoppy goodness at, I attended the Bremerton Beer Festival. The following weekend was spent in Portland for the 24th Aniversary of the Oregon Brewer’s Festival. In addition to the madhouse that was the Brewer’s Festival some of the local goods were also sample directly at the source. Deschutes, Bridgeport, Widmer, Tugboat and Amensia Brewing were on the “tour”. Needless to I was stupidly happy about sampling some of the best beers around. My liver on the other hand felt differently after taking more than one for the team. As part of the MTBBill Liver Recovery Act of 2011, it was time to get some pedals turning. The I-5 Colonnade MTB Skills Park is less than 10 minutes from where I’m staying so it is always good for a quick afterwork fix. Working part of the weekend is part of the work gig for this project, but Green Mountain was close enough to where I was working to allow for some grunting and grinning in the dirt after work. 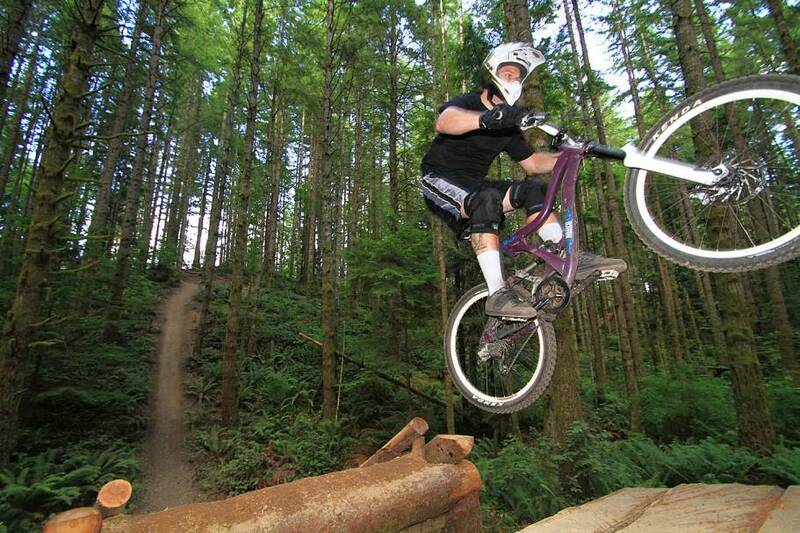 Duthie Hill Mountain Bike Park is the Seattle areas second MTB Skills Park and it is simply awesome. With 120 acres to work with they are produced a trail network that caters to nearly all types of riders. Wither you are looking to get your wheels in the air…..
Or wither you want to get that natural outdoor experience on a meandering trail through the trees. This place has all of that right in Seattle’s backyard. One of the lines I did not hit out here 🙂 I believe this trail was Semper Dirticus. The freeride double black diamond trails here are quite impressive. On this trip it was mostly from a spectactor perspective. I got the bike, I just need to develop the skills and get some testicular growth happening. I did hit some of the stunts and tagged my largest gap to date to thier is hope that I will get intouch with my inner hucker at some point. One of favorites from a trail with features perspective was Ryan’s Eternal Flow. It is more of XC trail with stunts and features more so than a series of features with a trail between them. Considering how close this place is I will certainly be back a few more times before this work trip is done.